Look quickly and you might see a sink full of dirty dishes. You might sigh deeply (loudly? ), turn on the faucet, briefly think to yourself, "Can't my shiny sink last for more than 15 minutes? ", rinse them off and put them in the dishwasher. Take a longer look and you might see something completely different. 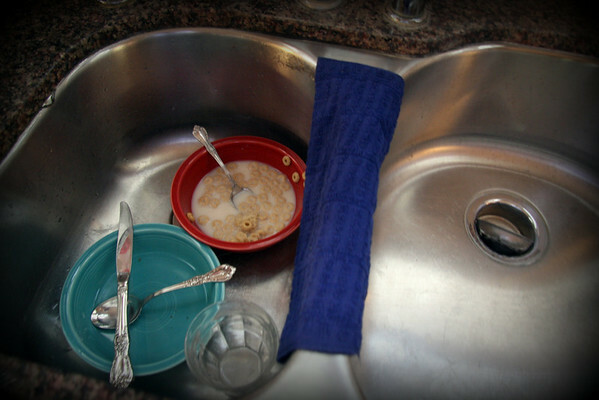 You'll see the turquoise bowl placed in the sink by my husband before he left for work. I'm thankful for his job and his willingness and ability to provide for his family. I am thankful that because of him I am able to stay home. You will also notice the red bowl with unfinished Cheerios and the empty glass from Annelise's breakfast. I am thankful our daughter is healthy and active, even if she tells me her belly is stuffed so she has a few minutes to play before leaving for school. I'll pour her a smaller bowl next time. Finally you see the knife used to spread peanut butter and jelly on toasted wheat bread, and then cut it in half (on the diagonal, for those curious few) for Annelise's lunch. I am thankful that I have the resources to easily shop for, store and prepare meals for my family. I am also thankful they love me even when there are long gaps between my cooking sprees. I am thankful I took the time to notice today. This month provides the perfect opportunity for me to reflect on my many blessings, both large and small. It's the small ones I usually overlook. From time to time throughout November I plan to reflect on the numerous things for which I am grateful and blog about them. Feel free to join me on your own blog and I'll definitely pop over for a visit. What are some things you could take a longer look at and see the opportunity for giving thanks? I feel the need to comment on this post because it's just what I needed today. I'm having one of those weeks where the glass just looks 1/2 empty, but you've reminded me to see it the other way and be thankful for things...even dirty dishes! Thanks for a great post and reminder! Again, you have written such a wonderful post! You are such a great writer...you have such an ability to express your feelings! And to think you are my friend! WOW!!! I feel a bit special!! I might take you up on the simple thankfulness of day to day life! Thanks for linking up at my place! I love your perspective - great reminders!! I like your take on life and your idea to sit back and really look at things and realize there are so many things for each of us to be thankful for... thanks for bringing that to our attention! I am going to try to do better myself to look for those things in my life that bring my joy and that I am truly thankful you... like friends like you! You have awesome perspective here. I totally appreciate it. And thank you for the "I've been there" over at my blog. It always helps to be reminded that these are universals of motherhood, right? The G's: Thanks for sharing that poem. It's very true!